​As we approach the Holidays, know this, a customer that shows today, buys today! Sales ObjectionsThe toughest aspect of any sales position is overcoming a buyer’s objections. Whether you offer a service or are a small business retailer, today’s buyers are more discerning than ever. Your goal is to have a convincing response to these roadblocks standing between you and that coveted sale. As many experienced sales people know, most all sales calls are met with at least one objection. We’ve gathered the most common sales objections on Budget, Authority, Need, Timeliness, and Value – along with the steps in how best to overcome each. Regardless of who you’re targeting, pricing is one of the most prevalent objections to a sale. For many sales professionals, the knee-jerk reaction is to immediately offer a lower price. Instead of offering up a fast discount (which is risky and raises questions about the value of your product), look for creative ways to show the unique value of your product or service. The ‘Price’ Sales Objection: Overcome the ‘Price’ excuse by demonstrating the unique value of your product, and give specific examples of how the product will solve a problem for the customer. Or even more difficult is the “My manager/boss says no thank you” Having a customer state that they need to consult their boss, partner or wife before making a decision, or an authority has already rejected your product or service can seem like a dismissal. Always respect their position, but look at this objection as an opportunity to get the decision makers in the room. Identify the concern and address that specific issue. Rather than agreeing to wait for a phone call, keep the process moving by setting up a joint meeting with both parties or transitioning the sale to the final decision maker altogether. Complacency or an actual fear of change can lead many potential buyers to dismiss a product before they’ve learned what it can do for them and their business. Remember that complacency is often a result of being ill-informed about a problem or opportunity, so if a potential customer seems complacent, you will need to take the extra time to describe the overarching problem or opportunity in depth. If you can, bring up examples or even better, case studies of their competitors who have made some recent changes similar to the one you are suggesting. Fear of change is a natural reaction, so you will need to calm the customer’s concern by showing examples of positive change within the client’s industry to provide a boost of confidence. This objection happens particularly around the holiday season. In this scenario, you must make it so compelling for them to buy—right now—that they feel as if they’ll truly regret passing up the opportunity. Simplify the buying process in some way, and lay out attractive terms that are only available in a very specific window of time. Make it clear that “waiting until the first of the year” will mean missing out on a great opportunity. Call Again Later: Demonstrate why it is best for the consumer to make the purchase now rather than wait 3-6 months. Simplify the sales process and address a current business problem. 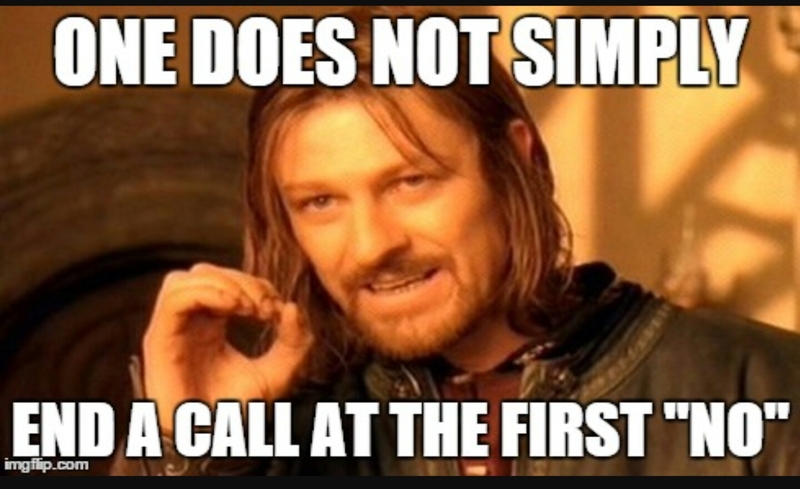 Before jumping into the conversation, however, be sure to follow up with the customer to find out if you are simply calling at a bad time or if there is an actual business problem overloading the customer. If its a bad time, find out a better time to call. If it’s a business problem, that gives you the information you need to show how your product will make the customer’s life easier. This objection is a combination of budget, authority, need, and timeliness. If the customer doesn’t see the value in the product, then it shows a lack of trust or certainty in what you’re offering. Here, you’ll need to build credibility with the buyer. Introduce benefits such as specific features of the products that address their needs, guarantees or return policies. Basically, demonstrate that value. These types of perks reassure the buyer that he or she is making the right decision and will help to build the buyer’s trust. As a sales professional, it’s absolutely necessary to understand and be prepared for the most common sales objections. Knowing every detail and feature of your product/service is important, but getting down into the true core of the customer’s objection is equallly crucial. Respectfully ask your buyer open-ended questions that probe deeper into the true core of their objection. With an understanding of your customer’s wants and needs and your product’s offerings, you are armed to tackle any objection based on budget, authority, need, time, and value. Above all, remember that your goal is to convince the potential buyer that they can’t, or shouldn’t, live without your product or service. The art of sales is inherently associated with objections, but most can be overcome by building a sense of credibility, trust, and re-framing the way your buyer sees what you’re selling. When it comes down to it, sales is about showing the product/service at the angle that’s best-suited to the conversation. Next Next post: 10 things you can do right now to improve yourself and your life. 10 things you can do right now to improve yourself and your life.